A pipeline has exploded in Mexico which has led to the deaths of 66 people. 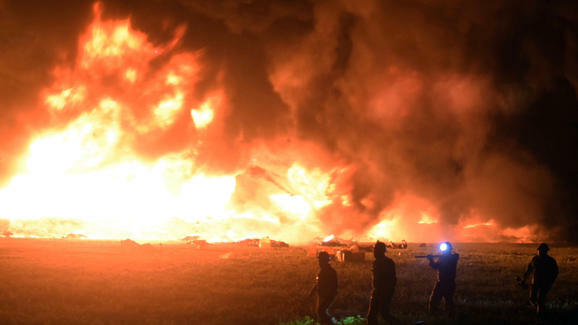 The separation and counting burned masses of corpses in central Mexico on Saturday after a massive fireball erupted at an illegal pipeline tap. Over 85 other people on Saturday were listed as missing. It occurred in a field where a duct had been breached by fuel thieves. Video footage shows flames shooting high and the pipeline ablaze. Screaming people ran from the explosion, some while burning. It is three weeks after new President Andres Manuel Lopez Obrador started an offensive against fuel theft gangs that have drilled dangerous, illegal taps into pipelines an astounding 12,581 times in the first 10 months of 2018, an average of about 42 per day. Lopez Obrador after taking office Dec. 1, deployed 3,200 marines to guard pipelines and refineries.